“Be careful” was the warning we received time and again from concerned family and friends after we told them we planned to spend three and a half months in South America. While Bali and Thailand are Aussie holiday-makers’ backyards, to a lot of people, South America seems completely foreign and riddled with corruption and cocaine. 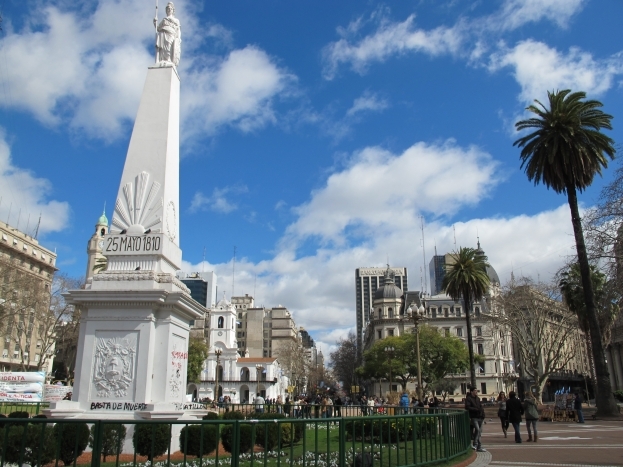 While the latter may be the case in parts, spending time in Buenos Aires quickly dispels any misconceptions. It’s a fascinating city, full of grand European architecture, wide, leafy streets and a nightlife that’s second to none. Portenos (aka Buenos Aires city slickers) are serious night owls. 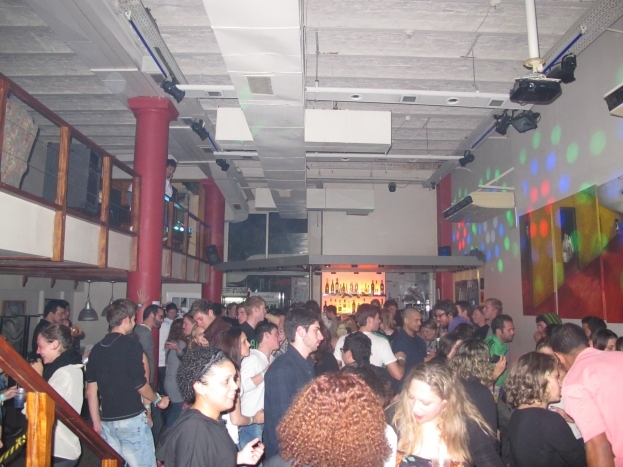 Every evening our hostel (the infamous Millhouse, pictured below) hosted a cranking party from 11pm. The lights turn on at 2am, suggesting it’s time for the roudy backpackers to head to one of the city’s notorious clubs. Unsurprisingly, a lot of the Millhouse residents didn’t see a lot of the city in daylight. Our bodies were saved from complete carnage by the fact we’d booked five days of Spanish lessons. 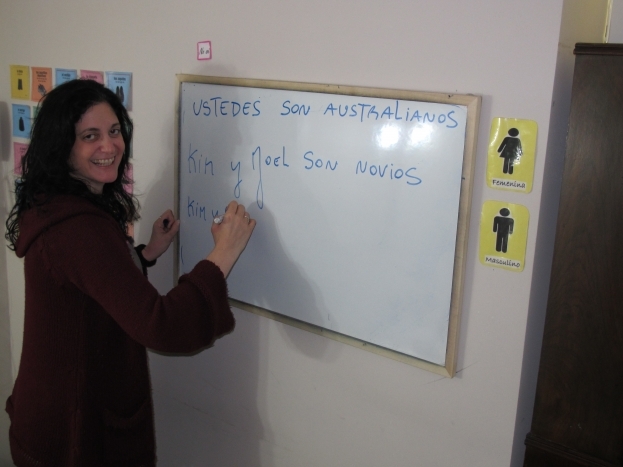 It was a fabulous experience – not only did we get a better grasp of the language from our hilarious teacher, Sonia, but it meant we got something productive done each day, even if a decent amount of timewas spent recovering from the previous evening’s shenanigans! Aside from learning Spanish and sampling the night life, Buenos Aires has plenty to offer travellers. The city is divided into distinct boroughs, each with a completely different vibe. 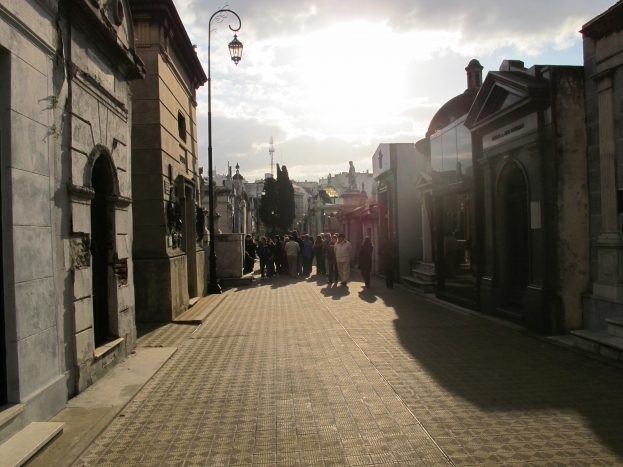 Recoletta is an arty area that’s home to two of Buenos Aires’ biggest attractions – the Sunday craft market and the famous cemetary. Lonely Planet describes the cemetary as a minature city of high rise buildings, and that’s pretty close to the mark. Argentinian dignitaries and wealthy people have been buried there for a long time, in some of the grandest shrines you’ll ever see. It was a bit eerie when you could see coffins through the glass doors! 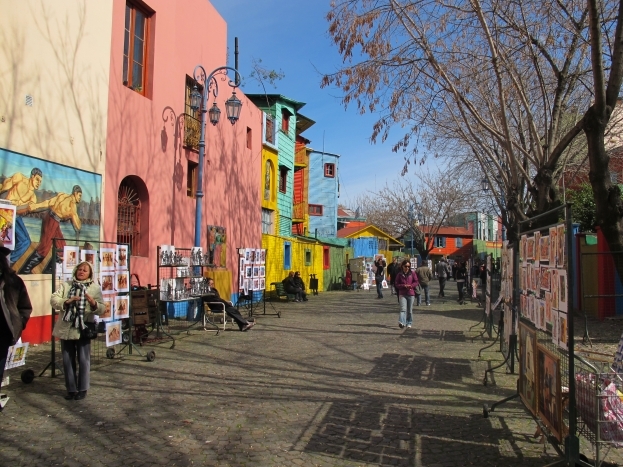 Another must-see area is La Boca. It’s full of coloured tin houses that were erected by Italian immigrants who used whatever materials were available to build ramshackle homes, painted with paint donated by the nearby shipyards. The result is a lively neighbourhood, full of tango dancers, touristy restaurants and great photo opps. Tourists are warned not to veer off the main streets, but we accidentally got off the bus a stop too early and found ourselves standing amidst a group of not-so-happy looking men. A local woman rushed to us and signaled for us to follow her to the main street, using the only English word she knew – “danger”. It gave us a bit of a fright, but once we were in the touristy bit we were fine. 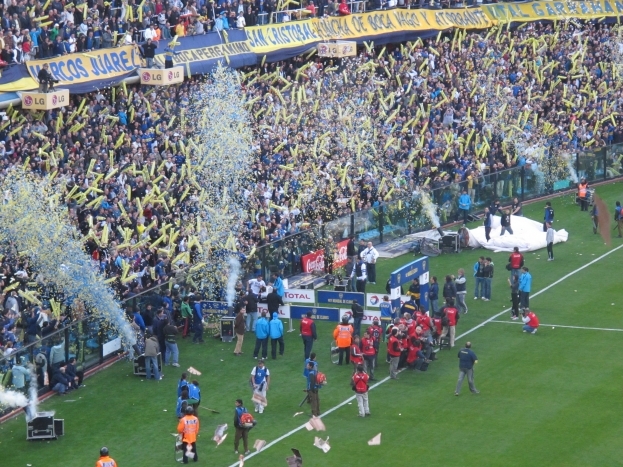 La Boca is also home to Argentina’s most popular football team, the Boca Juniors. 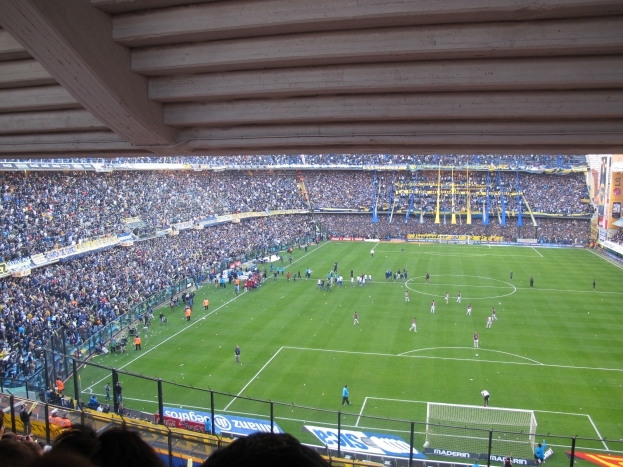 We were lucky enough to secure tickets to one of the biggest games of the year – Boca Juniors vs. San Lorenzo. We arrived at the game about two hours early because the stadium only lets one team’s fans in at a time to prevent an altercation. We were crammed in the standing area amongst the roudy Boca Juniors fans, who chanted and sang throughout the entire match, while throwing rubbish at the opposition goalkeeper. When Boca scored their only goal of the match, the crowd rejoiced like they’d all won the lottery. Tears filled men’s eyes as they reached to hug anyone within reach – including us tourists. I thought Collingwood supporters were passionate but they’ve got nothing on Boca Juniors lovers! Unfortunately the result was a draw – I can’t even imagine the joy the Boca fans would have displayed had they won. 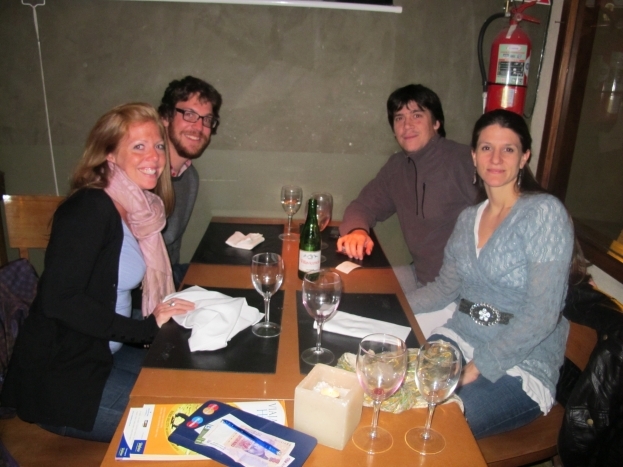 The other highlight of our time in Buenos Aires was having dinner with a local couple, Celina and Sebastian. 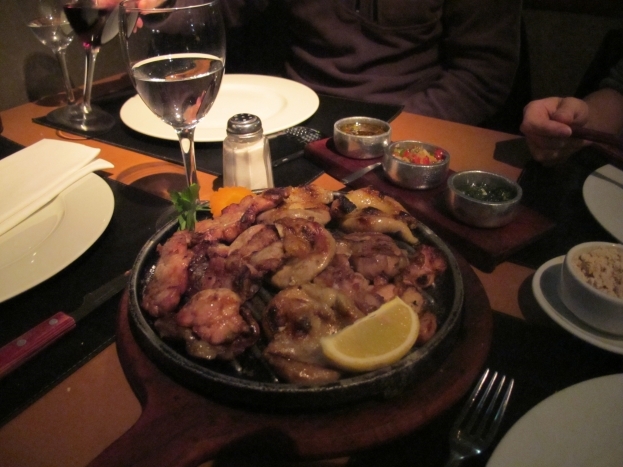 My friend Nikki put us in touch with them and they offered to take us out for a traditional Argentinian dinner. On top of giving us an insight into their country’s politics and way of living, they ordered us an entree that included cow intestines, followed by various cuts of steak and a bowl of fries. We were happy to try the local fare, but we won’t be ordering any more intestines on the trip! It’s fair to say that Buenos Aires lived up to its reputation for being the funnest city in the world. We can’t wait to get back there in December for a few days before we fly back to Australia.